It was Easter Sunday—a day ever memorable for this event in the annals of Erinn. Laeghaire and his court sat in state to receive the ambassador of the Eternal King. Treacherous preparations had been made, and it was anticipated that Patrick and his companions would scarcely reach Tara alive. The saint was aware of the machinations of his enemies; but life was of no value to him, save as a means of performing the great work assigned him, and the success of that work was in the safe keeping of Another. The old writers love to dwell on the meek dignity of the apostle during this day of trial and triumph. He set forth with his companions, from where he had encamped, in solemn procession, singing a hymn of invocation which he had composed, in the Irish tongue, for the occasion, and which is still preserved, and well authenticated. He was clothed, as usual, in white robes; but he wore his mitre, and carried in his hand the Staff of Jesus. Eight priests attended him, robed also in white, and his youthful convert, Benignus, the son of Seschnan. Thus, great in the arms of meekness and prayer, did the Christian hosts calmly face the array of pagan pomp and pride. Again the monarch had commanded that no honour should be paid to the saint, and again he was disobeyed. 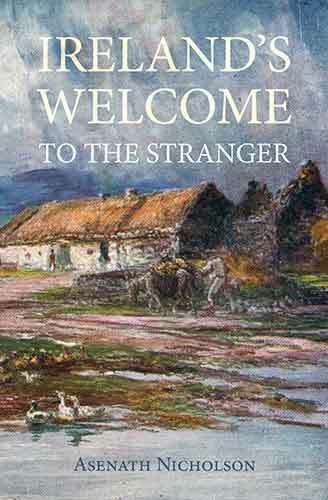 His own chief poet and druid, Dubtach, rose up instantly on the entrance of the strangers, and saluted the venerable apostle with affection and respect. 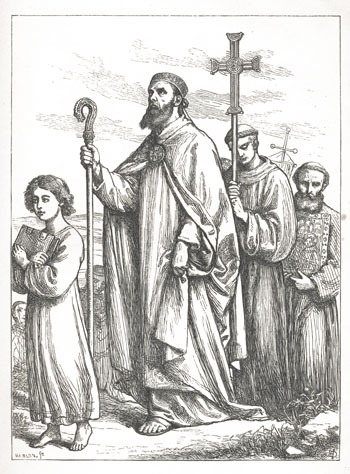 The Christian doctrine was then explained by St. Patrick to his wondering audience, and such impression made, that although Laeghairé lived and died an obstinate pagan, he nevertheless permitted the saint to preach where and when he would, and to receive all who might come to him for instruction or holy baptism. On the following day St. Patrick repaired to Taillten, where the public games were commencing; and there he remained for a week, preaching to an immense concourse of people. Here his life was threatened by Cairbré, a brother of King Laeghairé; but the saint was defended by another of the royal brothers, named Conall Creevan, who was shortly after converted. The church of Donough Patrick, in Meath, was founded by his desire. It is said that all the Irish churches which begin with the name Donough were founded by the saint, the foundation being always marked out by him on a Sunday, for which Domhnach is the Gaedhilic term. Authenticated.—A copy of this ancient hymn, with a Latin and English translation, may be found in Petrie's Essay on Tara, p. 57, in Dr. Todd's Life of St. Patrick, and in Mr. Whitley Stokes' Goidilica. We regret exceedingly that our limited space will not permit us to give this and other most valuable and interesting documents. There is a remarkable coincidence of thought and expression between some portions of this hymn and the well-known prayer of St. Ignatius of Loyola, Corpus Christi, salve me. Such coincidences are remarkable and beautiful evidences of the oneness of faith, which manifests itself so frequently in similarity of language as well as in unity of belief. The Hymn of St. Patrick, written in the fifth century, is as purely Catholic as the Prayer of St. Ignatius, written in the sixteenth. St. Patrick places the virtue or power of the saints between him and evil, and declares his hope of merit for his good work with the same simple trust which all the saints have manifested from the earliest ages. This hymn is written in the Bearla Feine, or most ancient Gaedhilic dialect. Dr. O'Donovan well observes, that it bears internal evidence of its authenticity in its allusion to pagan customs. Tirechan, who wrote in the seventh century, says that there were four honours paid to St. Patrick in all monasteries and churches throughout the whole of Ireland. First, the festival of St. Patrick was honoured for three days and nights with all good cheer, except flesh meat [which the Church did not allow then to be used in Lent]. Second, there was a proper preface for him in the Mass. Third, his hymn was sung for the whole time. Fourth, his Scotic hymn was sung always. As we intend publishing a metrical translation of his hymn suitable for general use, we hope it will be "said and sung" by thousands of his own faithful people on his festival for all time to come.